The OHV riding opportunities in Flaming Gorge Country are some of the most diverse in the country! You can choose to ride along the trophy fishing waters of Lake Flaming Gorge, roam the wildlife-rich sagebrush plains & canyons of Wyoming's high desert or head to the high alpine country of the Ashley National Forest. Of course, we suggest you stay around a little while and try them all. Below you will find our ever expanding list of trails to enjoy, as well as important information on how to be legal in both Utah & Wyoming. The Ashley National Forest District travel maps show travel opportunities available for high clearance vehicles, ATVs, and motorcycles. Many areas and trails on the Forest are open to off-highway vehicles. The Ashley National Forest adopts States of Utah and Wyoming Off-highway vehicle regulations, with the basic direction that all "areas and routes are closed unless designated open. Most of the upper portions of Flaming Gorge National Recreation Area are surrounded by public lands managed by the Bureau of Land Management, Rock Springs, WY Field Office. One can explore scenic basins or the unique Killpecker Sand Dunes. South of the NRA, the Uintah Basin BLM lands offer popular open riding areas for riders of all abilities. The Rock Springs Field Office manages more than 3.6 million acres of public land surface and 3.5 million acres of public subsurface minerals in the southwestern part of Wyoming. The field office administers a variety of programs including mineral exploration and development, wildlife habitat, outdoor recreation, wild horses, livestock grazing and historic trails. The Vernal Field Office is located in the northeast corner of Utah and administers lands within Daggett, Duchesne and Uintah Counties, plus a small portion of Grand County. The BLM also has Native American Trust responsibilities for Northern Ute Tribal and allotted mineral trust lands located within these counties. The area includes the south slope of the Uinta Mountains, the Uinta Basin, and the Book Cliffs region. The management area is bounded on the west by the Wasatch Mountains and on the east by the Douglas Creek Arch in Colorado. There are approximately 7,325,500 acres within the boundary, of which 1,725,500 acres are BLM-managed surface lands. The Vernal Field Office administers energy related mineral activities on 3.8 million acres of Federal mineral lands (includes 1.3 million acres of National Forest Service lands) and post lease mineral operations on Indian trust mineral lands. The Outlaw ATV trail runs through the beautiful Uinta Mountains. A portion of the trail runs parallel to the Flaming Gorge-Uintas National Scenic Byway. There are great views of the Uinta Mountains, canyons, lakes and many high-elevation grassy parks or meadows. Riding the entire trail is only recommended for riders with above average skills. Even though this trail is only 38 miles long it is an all-day ride. Portions of the trail are very challenging and most are very rocky. Allow a full day to cover the length of the trail. Download the Outlaw ATV Trail brochure here. Maps will be added soon to guide you in this high country adventure. The Swett Ranch trail is 6.0 miles long. It begins at the Greendale Overlook off UT Hwy 44. Descend from the Overlook on roads that encircle the historic Swett Ranch. This well preserved ranch offers a glimpse of local pioneer life, as well as tools used to work the land during the early 1900's. The Ranch is now maintained by the US Forest Service and is open to the public during the summer months. The trail is open for the following uses: Motorcycle Trail Riding, ATV Trail Riding, Off Highway Vehicles (OHV) less than or equal to 50 inches wide. This trail is open for use from May 1 to September 30, conditions permitting. Download a Swett Ranch Trail Map here. The Old Carter Military Trail is 6.7 miles long. It begins at Browne Lake Trailhead and ends at Road #059 At District Boundary. The trail is open for the following uses: Motorcycle Trail Riding, ATV Trail Riding, Off Highway Vehicles (OHV) less than or equal to 50 inches wide. Maps for this historic trail ride will be added soon. Get out and enjoy the newest ATV trail in Flaming Gorge! Completed in 2014, the Sheep Creek ATV Trail runs from Sheep Creek Lake through the forest to the newly renovated Summit Springs Guard Station. There are multiple trailhead parking opportunities along the route. 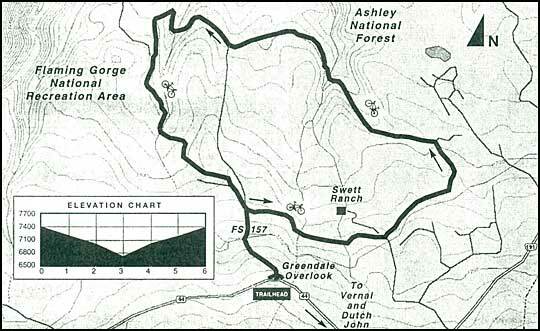 The main trail (#166) is 6.77 miles long and is generally an easy trail with a few moderately difficult sections. This trail is designed for ATV's that are 50" or less in width. The trail can be combined with OHV riding along the Spirit Lake Scenic Backway, making for multiple day riding opportunities. Click here to get our latest Sheep Creek ATV Trail Map. The Leucite Hills are the remains of volcanic flows from these Pleistocene eruptions. The presence of the Leucite Hills created a gap through which the prevailing westerly winds funnel. These winds are strong enough to carry sand and gravel. As the winds blow through the eucite Hills, the sand collects in large sand dunes. These dunes can reach heights of over 100 feet and run for over 100 miles from west to east. The biggest dunes are in the Killpecker Dune Field, which begins several miles east of the town of Eden. The area around the Killpecker Dune Field is home to a herd of rare desert elk, found nowhere else in North America. The rough and rocky terrain of the Leucite Hills, with its numerous springs of fresh water, was well suited to trapping and holding wild horses. The area became known as the Natural Corrals. Wild horses can still be seen in this area today. Thriving on the grasses of the Red Desert are descendants of horses brought to the New World by the Spanish in the 16th century. Many recreationalists enjoy hiking in the area, as well as driving off-road vehicles. Signs are posted as to the specific locations where off-road vehicles can be used. Access to the Killpecker Dune Fields and surrounding areas can be made through Rock Springs and Point of Rocks. From Rock Springs, travel north on U.S. 191. Approximately 10 miles north of Rock Springs, turn right at Sweetwater County Road 4-18 (at sign that reads Petroglyphs, Sand Dunes, Boar’s Tusk) and turn left at CR 4-17. From Point of Rocks, exit I-80 and proceed east on the paved road north of I-80. This road will lead past the Jim Bridger Power Plant and open-pit coal mine. North of the power plant, the road forks. Continuing straight west will take you to the Natural Corrals. Turn north and follow the road over the ridge and on to the wildlife viewing area and the Killpecker Dune Field. The Utah's Off-Highway Vehicle Program brochure outlines the basic responsibilities of OHV riders. The brochure covers registration, equipment, and operation requirements, safety tips, courtesy and ethics. Click here to get an OHV Safety Checklist. Obtain registration from the Utah Division of Motor Vehicles. Your OHV registration fees go directly back into the sport. Of the $21 collected from each registration, $13.50 is dedicated to the improvement of summer and winter OHV opportunities; $2 is used for safety and responsible riding education; $2.50 goes to the Division of Motor Vehicles; $1.50 to school trust lands; $1 goes to electronic transaction fees; and $.50 goes to fund search and rescue efforts. Owners of OHVs used only for agricultural purposes may apply for an "implement of husbandry" sticker instead of registration decals. However, if the machine is used for recreation on public lands or roads, it must also be registered for that purpose. Riding in Utah: Non-residents need UT Permit! Riding in Utah: Non-Residents may require a UT Permit! To obtain a non-resident permit, you must provide proof of out-of-state residency and that the OHV is not owned by a Utah resident. The cost for a 12-month permit is $30. Revenues generated from OHV user fees are dedicated to construction, improvement, operation and maintenance of OHV trails throughout Utah. · Proof of residency: driver's license or other state issued identification. Non-resident permits may be obtained by mail. · Find out the status of your state. Much of Flaming Gorge National Recreation Area is in the wild, wonderful state of Wyoming. There are hundreds of miles of suitable backcountry roads, both in the NRA and the adjacent BLM lands. Download the Wyoming ORV Regulation information here. Here is a brochure on Wyoming Hunting and ATVs. Thank you for visiting http://www.flaminggorgecountry.com/ATV-Adventures! Be sure and revisit flaminggorgecountry.com frequently for content updates and more.